On board temperatures, voltages and currents and other telemetry data available from readings taken by the payload itself and, if available, by monitoring the data available on the CAN bus. “Whole Orbit Data” for orbit illumination/eclipse demonstrations. More advanced demonstrations relating to antenna radiation patterns and levels of solar radiation. Long term effects of radiation on microcircuits and other subjects would also be possible. The project will also include the development of suitable software to enable the display of the telemetry data and orbital tracking/prediction information and actual satellite attitude in an interesting and lively way. The display software will be developed in collaboration with teachers and will be available in different “flavours” to accommodate a variety of age groups. In addition to displaying the telemetry, the software will also have a live “tracking map” display with predictions for the particular school location and be capable of visually showing the spacecraft attitude and spin rates. The payload will also enable the uploading (indirectly via a moderated host) of short greetings messages for schools to use and the deposition of the data received by a school on a central database. This central data will also be available to be retrieved by schools for display and analysis. We envisage that inter-school competitions for, say, the most data collected in a period, the most inventive use of the data, or reports of “lessons learnt” from different age groups could be easily established with prizes and presentations. The secondary purpose of the payload is to provide a transponder for use by individual radio amateurs around the world at night or during holiday periods. This transponder would be a single channel system using FM modulation for the 23cm uplink and 2m downlink. The space segment will be based upon hardware and already developed for the AMSAT-UK FUNcube project. 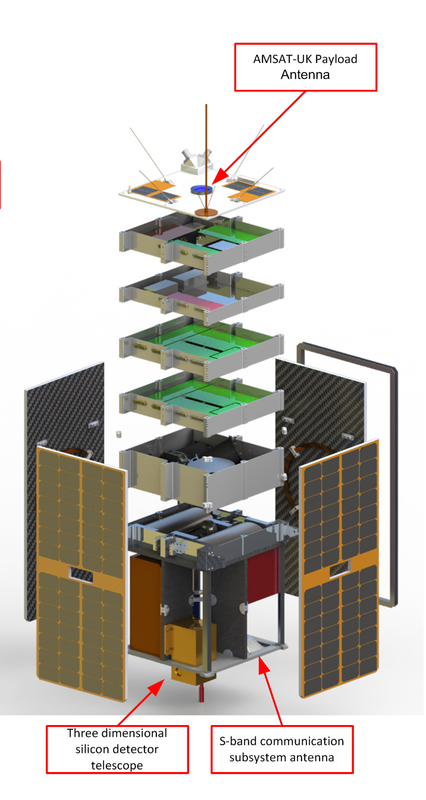 The launch of FUNcube-1 is expected this year and the UK Space Agency’s first cubesat UKube-1 will carry a set of the FUNcube boards. 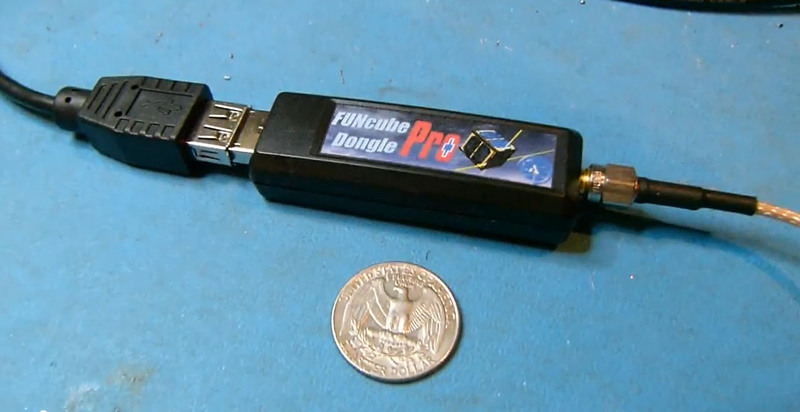 The USB FUNcube Dongle PRO+ for the ground receiver is already in volume production. The AMSAT-UK payload will be undertaken by an experienced team of volunteers drawn from its membership. An antenna to receive signals in the amateur satellite service on two discrete frequencies in the 1260-1270 MHz band. The signals will either pass to the command receiver chain and onwards to the command decoder. Alternatively uplinked voice signals from radio amateurs will be passed through to the 145 MHz oscillator and modulator in order to be used for a single channel FM voice transponder. Data from embedded sensors and, optionally, obtained from the data flowing on the CAN bus, will be encoded into a telemetry stream with FEC applied. This data stream will be used to modulate a BPSK carrier and fed to the 145 MHz combiner. Either or both signals will then pass to the 145 MHz amplifier chain and the transmit signal, passing through suitable filters, will go the antenna. The filter will reduce all harmonics and spurious signals to levels that will not disrupt the operation of the other RF system being used on the spacecraft. 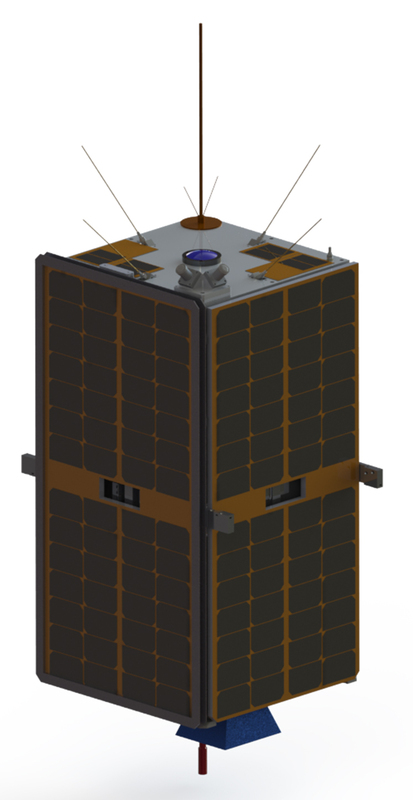 An operational plan will require to be defined but it could be envisaged that after the Launch and Early Orbit Phase (LEOP) has been completed the educational payload would be operated when the spacecraft is in sunlight – when schools are most likely to active. This mode would assist the onboard power budget when other experimental payloads are operational. In later phases of the mission it might be expected that the education payload could be operated in sunlight and the amateur payload when the spacecraft is in eclipse, or, if the power budget permits, both payloads may be functional at the same time. For schools the ground segment will typically consist of a turnstile (crossed dipole) antenna with an active filter. This will feed the 145 MHz downlink signal to a FUNcube Dongle SDR PRO receiver which plugs into any Windows PC or laptop. Using such equipment, the link budget will be sufficient to enable reception of signals at a satisfactory level on all passes where the elevation exceeds 15 degrees. For radio amateur users, similar simple equipment will suffice to listen to the FM voice downlink. Those users who wish to use the FM transponder will require about 100 watts EIRP e.g. 10 watts to an 8 element Yagi on the 1260 MHz uplink. To display the telemetry, suitable display software will be developed together with a central data warehouse to enable schools to access data from prior orbits over the internet. The AMSAT-UK team will also assist the development of the software for schools and support the creation of teacher aids and lesson plans to ensure the best possible benefits for school students.